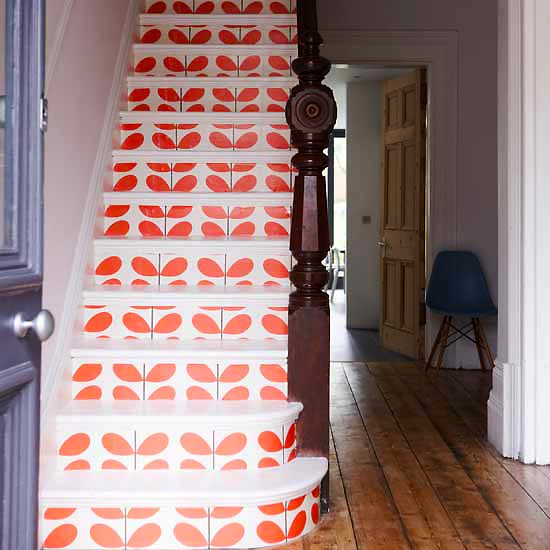 I love pattern or anything unexpected on stairs. We should treat these areas as rooms as we use them everyday and give them some extra details. I have been toying with doing something fun like these images with my stairs. Most of these ideas are easy to do and not costly. From Dash and Albert available here are so easy to install. You can have it done professionally or a staple gun will work too. Big impact for reasonable price. 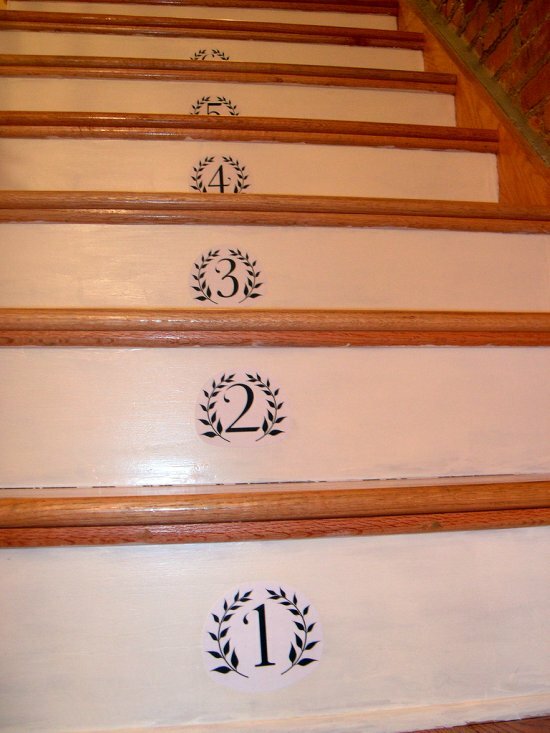 So many great ideas that you can add to stairs to give them life and personality. Few quick pics from last weeks open house lots of fun, great people, delicious cookies and hot chocolate. Today it is my turn. I have decorated a dozen trees this holiday and today it is my turn to get my poor neglected house into holiday mode. I am so happy to see color in a kitchen that is not white or yellow. Don’t get me wrong I really like white kitchens and in my own kitchen the walls are yellow but so many kitchens are beginning to look the same. I was just having a conversation with one of my reps yesterday about how old he gray and no or little color trend is becoming. When you live in this part of the country in central NY, especially at this time of year you just look outside and see all the gray you need. I think when you have great light like LA or Florida grays are beautiful and work. Here you need to be so careful that your inside does not look like one blob that blobs into the outside so I tend to tread very carefully with grays. My new kitchen obsession is designed by Tobi Fairley and her mom Beverley Wells which is purely genius. I first saw this kitchen from blogger Maria Killiam who did I post on it and I had to share the photos. The original photos are from At Home Arkansas. The turquoise cabinets are the perfect shade of blue. What is brilliant is the gray Corian countertops that tone down the cabinet color and blend in with the chrome and stainless. Plus you have a chic kitchen pulling in the gray trend in but just the perfect amount of gray. Check out the dash and albert rug (Available at Elan Interiors Home Boutique) which pulls the floor and the cabinets together. Window treatments is lovely too, in any other kitchen may look a bit fussy. I have always been a painted trim, woodwork, and cabinet kind of girl. However I have been seeing some fantastic homes that are incorporating natural woodwork in the design and the feeling is a beautiful European look. It seems to be a top question clients ask if they should have have painted trim and cabinets or leave it natural. The strange thing is most of the guys have some strange obsession with natural woodwork. I am not sure if it is the primal being in them getting back to their roots which give them such a strong opinion on this topic. The women usually want painted and a light feminine look. I think there are ways to make both sides happy. I tend to gravitate to the lighter wood species like white oak and greyed or washed woods. What works in these spaces below and that appeals to me is the abundance of white or cream which balances everything out giving a light, airy, earthy feel, a Ying and Yang approach. I have been obsessed with this photo love everything about it, the balance of natural woodwork with white and pattern can not be beat. Technorati Tags: natural woodwork,white oak,cabinets,door frames,windows. Swedish/ European style – rustic white wash, stone and crystal with hits of green make the room. Beautiful.